The horsetail plant, also called scouring rush, is a plant that is found growing in all countries of the world except Australia. Horsetail grows naturally in wet places such as swamps and ditches or planted along ponds and water features in home landscapes. Horsetail is harvested in northern Mexico and used for polishing wood and furniture. The plant has creeping rhizomes that grow aggressively but can be controlled. The horsetail plant is a reed-like perennial that spreads quickly. The plant grows to a height of 3 feet with evergreen stems that are 1/3 inch in diameter. 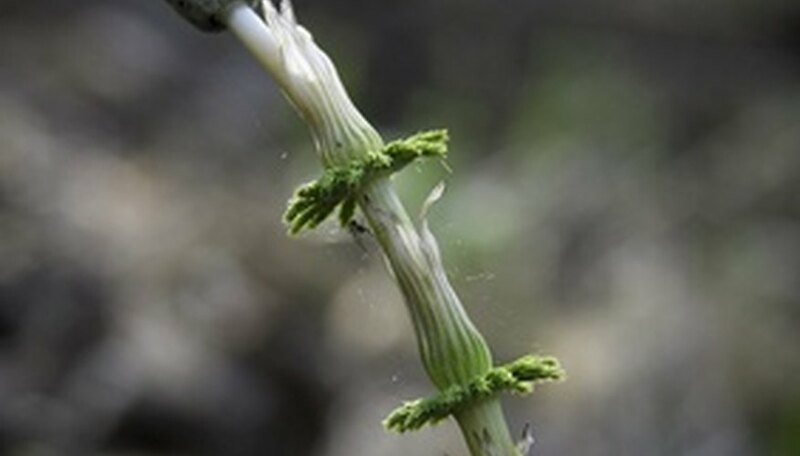 Horsetail stems are cylindrical, hollow and have many joints with no branches. The tips of the stems form strobilus, which are cone-shaped and brown in color and produce microscopic spores. The horsetail is hardy to plant in USDA growing zones 3 through 11 depending on the variety. Horsetail prefers a normal to wet soil and full sun to part shade light conditions. It is common to find horsetail near ponds and bodies of water. The soil should be acidic with a pH of 4.5 to 6.5. Ground rock sulfur can be worked into the soil to lower the pH number at least two weeks prior to planting. Use an acidic potting soil when planting horsetail in a container. Horsetail plants do not require excessive maintenance. Give the horsetail plant supplemental water when the soil dries to several inches in depth. Heavy water soakings to a depth of 15 to 18 inches is preferred. Horsetail does not need to be fertilized or pruned for maintenance. Plant the horsetail with a soil barrier to restrict invasive spreading. Planting in a container will contain growth and allow for easy movement of the plant. The horsetail can be propagated by dividing the rhizome roots. Horsetail rhizomes grow shallow and can be easily dug from the ground. Divide the rhizomes into clumps that include sections of roots and green stems. Plant the divisions in a hole that allows the horsetail to be at the same depth it was previously growing. Divisions should be planted immediately to prevent the rhizomes from drying out. Horsetail plants are not susceptible to problems with insects or disease. The plant contains silica crystal, which is sharp, making it painful and deadly if ingested by animals. Do not plant in areas where cattle graze to prevent a problem. Horsetail has aggressive growing rhizomes which spread quickly. Rhizomes must be removed completely to prevent small plants from popping up in areas the plant was removed.